Which building is that in the background? The two females are standing in the middle of what is now Embsay Reservoir. The building is Whitfield Mill which was about one mile further upstream from the Tannery. The hamlet of Whitfield and most of the mill were demolished when the reservoir was built. The only part now standing is a small out-building, possibly the one on the right of the mill. The mills last function may have been as accommodation for some of the 110 workers employed there. 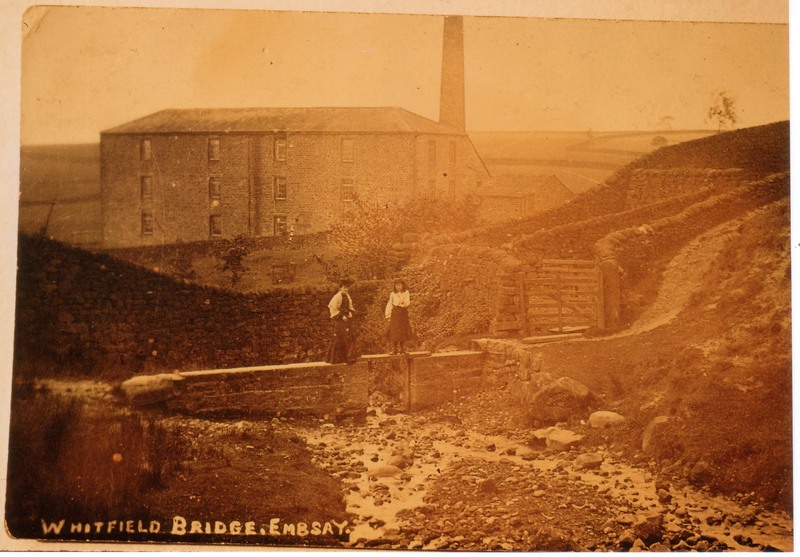 An extract from Skipton Town Council Year Book reads: 1910 June 21st – Embsay Reservoir opened by Councillor W R G Farey, J.P., Chairman of the Council. After lunch at Town Hall, members of Council and guests proceeded to reservoir where Mr E P Hill (engineer) presented key of valve tower to Councillor Farey and Mr W S Arnold (contractor) presented Councillor Duckett, Chairman of Water Committee, with a rose bowl as a momento of the event. Peter Sheeran is incorrect about the position of the bridge. The building is, indeed, Whitfield Mill, but the bridge is BEHIND the current reservoir, on the moor, outside the reservoir wall. At the time of the photo, slats could be inserted under the bridge to form a dam. The resulting pond was the sheep wash for the village. There is a modern footbridge in the same position now. The two ladies are NOT standing in the beck which now the reservoir, but upstream from the reservoir, outside the perimeter wall. There is now a wooden bridge across the beck carrying the footpath up to Embsay Crag. The large stone on the right of the photo can still be identify now. The photographer was facing southsouthwest and the large building is indeed Whitfield Syke Mill.